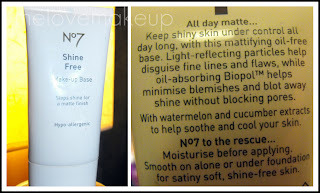 Sophsterlicious • UK Blog: No 7 Shine Free Base - My thoughts. So last year I wrote this post about how I really wanted to try this face primer from boots. Shortly after writing it I got it and have been meaning to review it ever since, so here it is, finally! So, before I bought this I read loads of reviews, most of which were negative, but I thought 'what the hell' and bought it anyway, because I liked the sound of what it did and I have very oily skin and was sick on my foundation sliding off my face after half a day. So, I bet you're wondering what I think of it, ain't ya? Well actually, I am pleased to say that I love it! This is a must have for me now and I will repurchase over and over. It works wonders, It keeps everything in place and my skin does NOT get oily at all when I wear this, It stays nice and matte, ALL day long. So, in the reviews I had read before I bought it people were saying how it was thick and difficult to work with, which is true, if you don't use it properly, I'll admit, I played around a bit to find a way for it to work, and now it does. It comes out of the bottle as a really thick white cream, with a smooth texture. The trick is to dab it on your face, and only where you get oily, don't try and rub it in like it is some kind of face lotion or something. I just dab it where I need it and pat it in gently around that area until it has absorbed (no time at all) I then wait a minute or so and get on with my eye make up, and then go back and apply my foundation. My foundation applies perfectly over this and as I said earlier, it lasts all day. I've tried to demonstrate in this picture how I apply it, by dabbing it until it's soaked in. I was going to use my last No7 voucher on this a few weeks back but I had a bit of an emergency so had to get something else for that night with it instead. I might get it out once my L'Oreal Studio Secrets anti-shine primer is finished and see how they compare. I got this a while back with one of the £5 No7 vouchers. It's pretty good, but can be a little *too* matte for me. Ooh, I hadn't heard of this- but I need it for my nose! It's on my wishlist next time they do a £5 till spit! Thanks for such a great review and the tips!